While a fairly common plant to organic gardeners and permaculturists Yacon deserves to be more widely grown. It is a vegetable that produces a delicious root crop, and best of all it is hardy and virtually maintenance free. I tossed a piece of this down the bottom of the garden and six months later had a two metre high plant that yielded about 4 kilos of edible tubers. 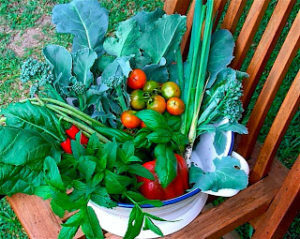 No watering, no feeding and no pests! Native to the Andean South American countries it has value eaten raw – where it tastes like crunchy ‘pine’ flavoured apple, or roasted where it takes on a caramelized taste. The sugars in it are not absorbed by the body and researches are looking into its value for use by diabetics. Plant the purplish ‘corms’, that appear on top of the tubers, in autumn and harvest after flowering in June/July. Like pumpkin – the flavour and texture of the edible tubers improve if stored in a cool, dark, shady place for a week or so. It gets to about 2m or so and will grow in sun to semi-shade. It is best grown in a perennial bed alongside larger edible plants. I grow alongside turmeric, galangal, sweet potato and cassava where it seems quite happy. 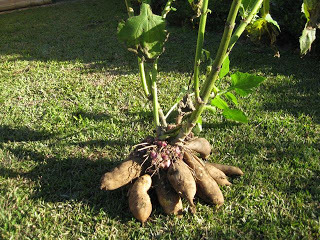 Take care when harvesting as the tubers are very brittle and will not store if damaged. 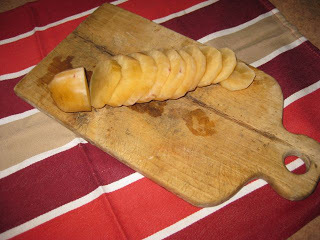 It is delicious ‘raw’, tasting like a crunchy apple, or can be roasted like potato. TIP: for roasting, cut into bit sized pieces and toss with olive oil, balsamic vinegar, salt and pepper and bake for 20-30mins at 180C in a roasting tray. Yacon is virtually unknown in the USA. It isn't as easy to grow in my temperate climate, but I get a decent yield. Everyone who tries it says: "This is good!" It's so easy to store and is a wonderful prebiotic. I've only had one person recognize the plant in my garden. Yep, you guessed it, an Aussie!